Lay out blocks on the table as per an example from one of the books or make up one of your own. You will notice in this example there are two 3’s instead of a 6 in the first polynomial. This allows for the addition of 3+3=6 and the multiplication of 2×3=6. You can add in lots of these kinds of opportunities as you go along. Have the student count and identify how many? and what kind? and then write out the polynomials one under the other on the board, lining up the like kinds with each other. After that it is a simple case of having them count the total amount of each kind and writing the amount down on the board. I like to use the whiteboard with lots of colorful markers as it is much more fun than writing in the workbooks. I find that most students like to put their artistic touch on the whiteboards and I generally give them time to do so because when they are having fun they learn better. 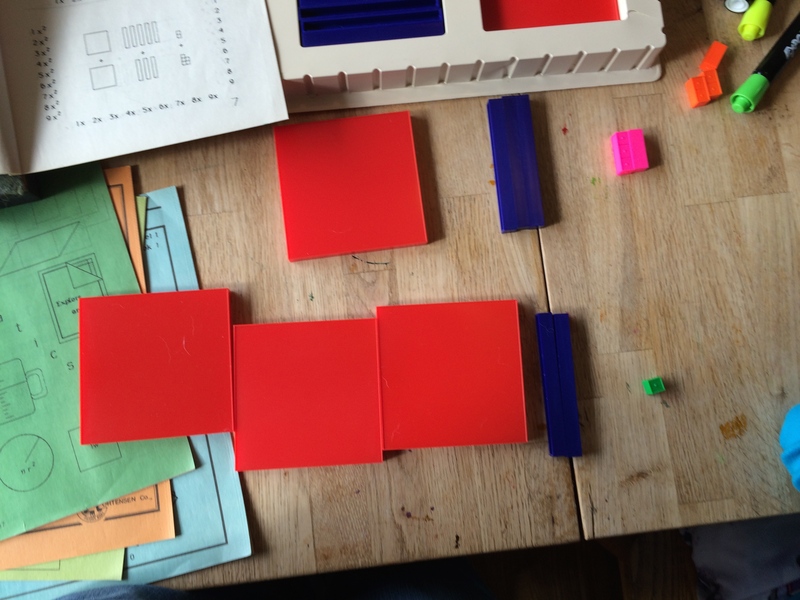 We used the EZ blocks this time because this particular 7 year old student loves the neon colors of the unit blocks. You can take pictures if you want or need a permanent record of what was done.